Once upon a time in Wimbledon, there lived a king called Roger! Wimbledon is a bit like Disneyland – it is a world of make-believe. Everything about it is far from reality, but once you are taken by the trance, there is no coming back. The magic that the only major still played on green lawns casts – with its white dresses for ‘gentlemen and ladies’, the strawberries and cream, the royalty, the Dukes and Duchesses, the formal attire of the audience, the ball boys and girls in their greens (now blues), the ‘quiet please, thank you’ takes you into a world of its own. Like Mickey Mouse at Disneyland, you know it is not quite real, but like in Disneyland, you still best enjoy it when you drown yourself in the shows and the parades that transport you into a different world of its own. It is difficult to pin-point what exactly it is about Wimbledon, but it has been doing this to tennis players and fans across the world for over a hundred years now. And if anything completes this fairy tale of modern times better in today’s era, it is the sublime grace and majesty of Roger Federer in full flow. Like many tennis fans across the world, I witnessed a bit of that magic over the past couple of games at Wimbledon. More so in the semifinal against Djokovic, but partially also in the finals against Murray, Federer gave us glimpses of the sheer genius and astonishing brilliance that he was worshipped for, and which, even at the age of 30, he is still capable of. In all honesty, till the end of the second set in the finals, we were searching for that flash of genius from Federer. His game till that point reminded me a bit of the knock in the 2011 Cricket World Cup semifinals that Sachin Tendulkar played against Pakistan – an old maestro who knew the importance of the occasion and wanted to give his best, but, in the face of an inspired opponent, was just about surviving and seeing things through – almost lucky to still be in the game. I don’t know what it is about our sporting idols that we expect, that even a slight drop in their invincibility makes us disappointed. But for most of the semifinal and, perhaps, from the end of the second set in the finals, Federer was operating in ‘the zone’, coming up with shots and serves, almost at will and at the right time, that left the audience spellbound and brought back memories of the glorious genius of Federer that we had experienced in the past. With 16 grand slams in his kitty even before the one he added at Wimbledon this year, Federer was already assured of a place among the all time greats to have played the game. But now, the arguments and discussions about whether he is, indeed, the greatest will probably start all over again. Even when he was at the peak of his game a few years back, there used to be a story of an American and an Australian fan arguing whether Pete Sampras or Rod Laver were the greatest of all time. And how a Swiss gentleman barged into their argument, and said that the greatest is still playing the game and his name is Roger. At that time it was still a prediction, but by the time Federer is done, it is possible that there will be no more discussions – it may well be a foregone conclusion. Who knows what else is in store? And a few years from now, tennis folklore will have stories of his magic. 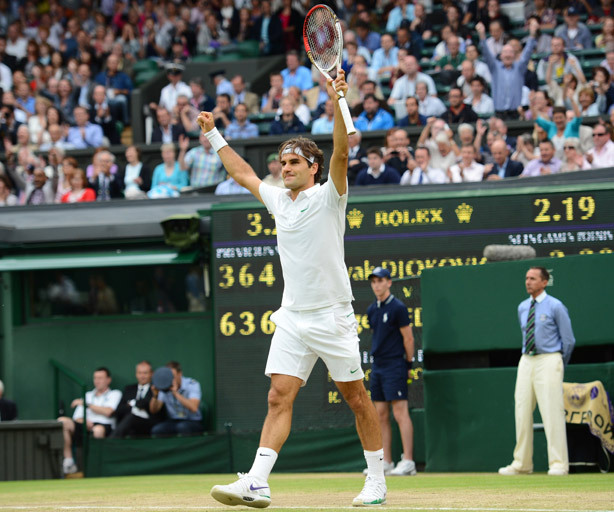 And those stories will start like this: Once upon a time in Wimbledon, there lived a king called Roger! 2 Responses to Once upon a time in Wimbledon, there lived a king called Roger!